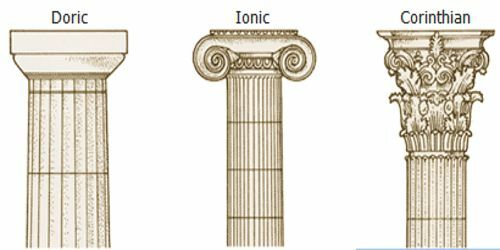 The Doric style is rather sturdy and its top (the capital), is plain. This style was used in mainland Greece and the colonies in southern Italy and Sicily. 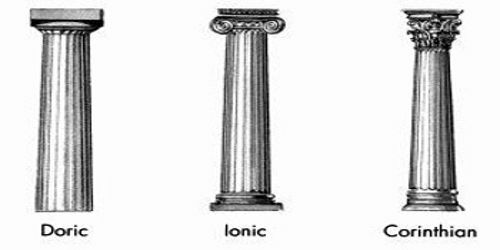 The Ionic style is thinner and more elegant. Its capital is decorated with a scroll-like design (a volute). This style was found in eastern Greece and the islands. Parthenon – temple of Athena Parthenos (“Virgin”), Greek goddess of wisdom, on the Acropolis in Athens. 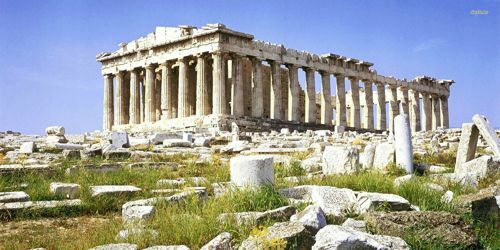 The Parthenon was built in the 5th century BC, and despite the enormous damage it has sustained over the centuries, it still communicates the ideals of order and harmony for which Greek architecture is known. The Temple of Apollo at Didyma – The Greeks built the Temple of Apollo at Didyma, Turkey (about 300 BC). The design of the temple was known as dipteral, a term that refers to the two sets of columns surrounding the interior section. These columns surrounded a small chamber that housed the statue of Apollo. With Ionic columns reaching 19.5 m (64 ft) high, these ruins suggest the former grandeur of the ancient temple. The Temple of Athena Nike – part of the Acropolis in the city of Athens. The Greeks built the Temple of Apollo at Didyma, Turkey (about 300 BC). The design of the temple was known as dipteral, a term that refers to the two sets of columns surrounding the interior section. 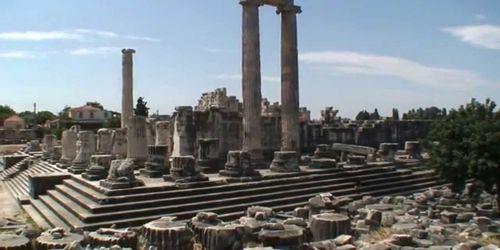 These columns surrounded a small chamber that housed the statue of Apollo. With Ionic columns reaching 19.5 m (64 ft) high, these ruins suggest the former grandeur of the ancient temple. Most ornate of the classic orders of architecture. It was also the latest, not arriving at full development until the middle of the 4th cent. B.C. The oldest known example, however, is found in the temple of Apollo at Bassae (c.420 B.C.). The Greeks made little use of the order; the chief example is the circular structure at Athens known as the choragic monument of Lysicrates ( 335 B.C.). The temple of Zeus at Athens (started in the 2d cent. B.C. and completed by Emperor Hadrian in the 2d cent. A.D.) was perhaps the most notable of the Corinthian temples. Acropolis in Greek means “The Sacred Rock, the high city”. All around the world the Acropolis of Athens is known as ‘The Acropolis’. There are many Acropolises in Greece but the Acropolis of Athens is the best known. The Acropolis is primarily dedicated to the Goddess Athena. But humans from the prehistoric era have populated the Acropolis and the caves around it. Situated in the middle of Athens, many myths, festivals and important events are connected to the sacred Acropolis. The Acropolis echoes the grandeur and the power of the Athenian empire….